From ATLUS' all-star team that brought the Persona series to life, and animation by Studio 4°C, known for anime movies 'Memories' and 'Tekkon Kinkreet Black & White', Catherine Classic is a masterwork in stylish presentation and design. Vincent's heart is torn between two women. On one side sits Katherine, the girl who intends to wed Vincent someday. On the other, Catherine, who appeared out of nowhere. Both of them pull at his heart and soul. The story can take many paths, and the outcome of this romantic horror tale can go to unimaginable places. 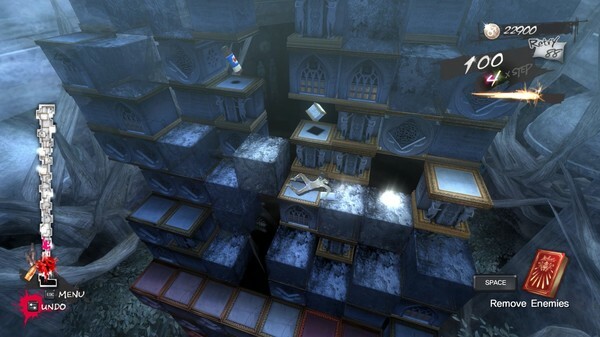 Move the blocks to create a path and climb a nightmarish tower while fleeing from the monsters chasing you. The lowest levels of blocks fall as time passes. If you're not constantly moving, you'll fall with them. There's no time to waste! Various obstacles impede Vincent's path. Some blocks are traps, waiting to skewer unwary climbers. Others explode, damaging everything around them. The sheep in the nightmare are desperate to survive until morning, too. They'll get in your way, mess up your blocks, or even try to shove you off. You'll need your wits and the help of strange items that can deal with the sheep, remove hazards or create new paths if you want to reach the top! Play through Vincent's twisting story of love, lust, and self-determination in Golden Playhouse. Take on the tower's challenges for high scores, single player or local co-op, in Babel. Catherine Classic brings to PC the original version of ATLUS' unparalleled classic action puzzler, now enhanced for modern PCs.